David Tran. At the age of 30 he saw the fall of Saigon. 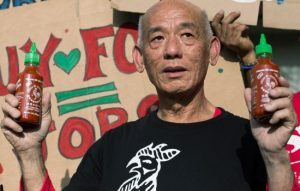 “When Vietnam changed to Communism they stopped any business.” He was considered ethnic chinese, the unwanted minority, was part of the 30,000 refugees shipped to Hong Kong (A.K.A frozen ducks who were left on boats for months). He would manually dump chile into a grinder, causing the hot, stinging juice to run down his arms. When he would come home he couldn’t hold his daughter. There’s a rooster on the bottle because David was born in the year of the Rooster. In 2012 20 million bottles were sold. David’s factory makes 3,000 bottles an hour, 24 hours a day, 6 days a week (70,000 bottles a day). They just built a new factory that will make 18,000 bottles an hour. They use 48,000 tons of Chiles a year from ONE supplier. That’s 100 million pounds of peppers. The one supplier has the chiles at David’s doorstep 2 hours after harvest.